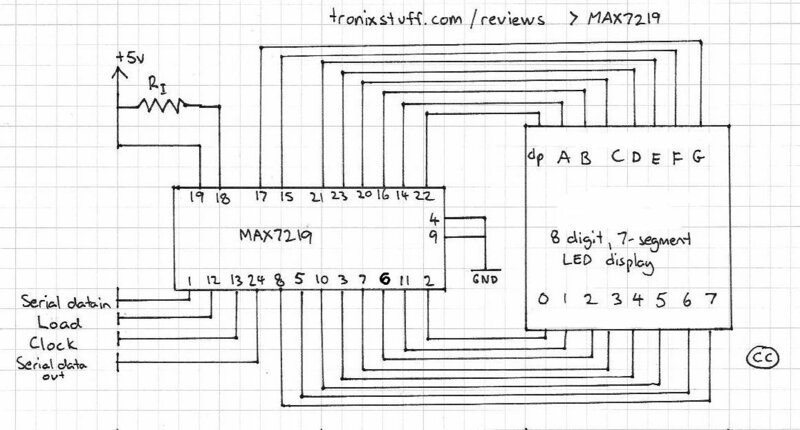 Today we are going to examine the Maxim MAX7219 LED display driver IC. The reason for doing so is to show you how something that used to be quite complex can be made very simple – and that is what all this technology is for, isn’t it? Not any more! 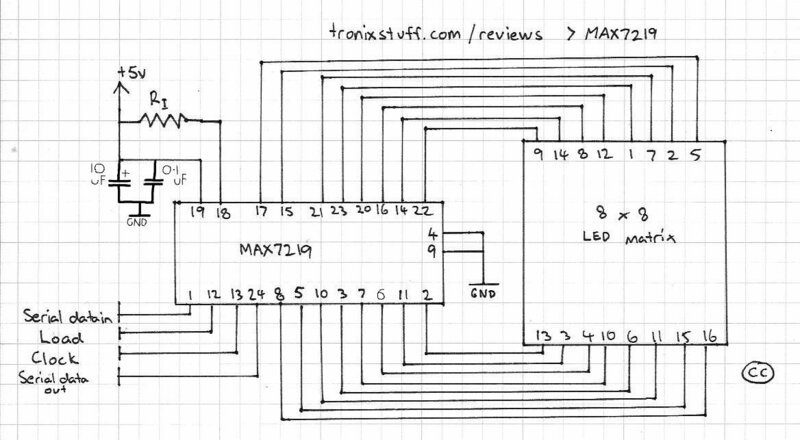 The MAX7219 combined with a great library (well for Arduino anyway) solves all the headaches in no time. After using it for the first time today I was briefly angry for not finding out about it sooner… better late than never. Interfacing the MAX7219 is also very simple, you only need three digital output pins from a microncontroller, 5 volts and ground. 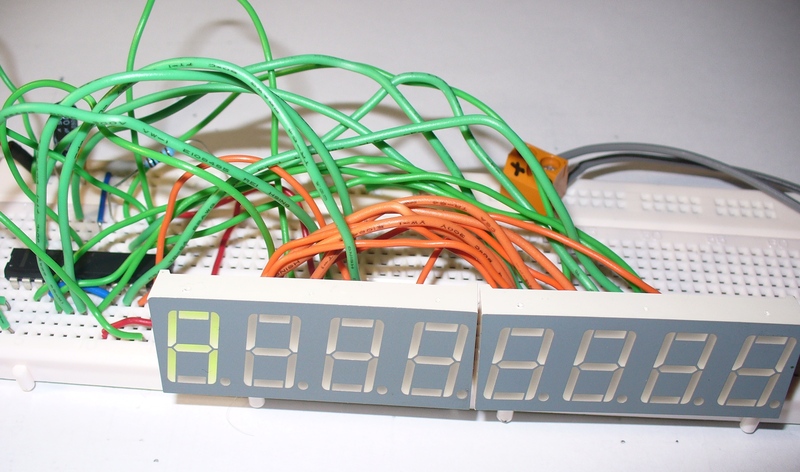 Up to eight ICs can be cascaded to control up to 512 LEDs at once – from only three data pins. Wow. However, controlling all these LEDs will require a power supply that can allow 330 mA just for the IC, so you can’t just run this off your Ardiuino – you will need external power. Nothing an LM7805 regulator cannot fix. At this point I should mention it is designed for common-cathode display systems. Normally you would have to program to switch on individual rows and columns, and repeat those commands in software, as well as using switching transistors or a 74HC4066 to control the cathodes. It has input pins for each of the eight LED elements, and four cathode pins, one for each digit. 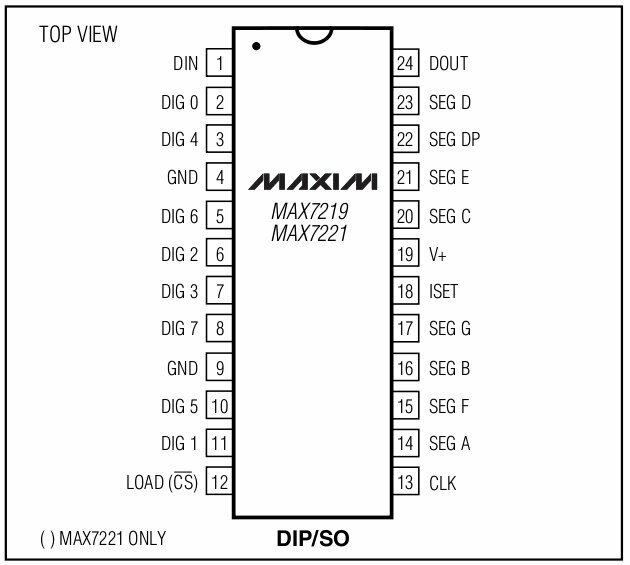 We can use two of these displays with the MAX7219 very easily, as you will see below. In the above photo, the five wires on the left are connected to the Arduino board (5V, GND, load, clock, data). The two wires from the terminal block head to my DIY 5v power supply. Using the lc.setLed() saves a lot of code, as the chip will hold the display on until it is told otherwise, you don’t need to program in a delay loop. You can just enter X and Y coordinates for the LED to switch on. To switch off the display to save power, use lc.shutdown(0, true); – replace true with false to switch it back on again. Question – What was the manufacturing week and year for my MAX7219? Well that’s enough blinkiness for now, I could spend a week making displays with the MAX7219. In all honesty, I can say that it makes life exponentially easier when trying to control more than one LED with a microcontroller. Therefore it really is highly recommended. The only catch is the MAX7219 isn’t the cheapest IC out there. eBay seems to be full of counterfeit versions – just compare the Maxim Direct 1000+ price against the eBay price – so please avoid disappointment, support your local teams and buy from a reputable distributor. Living in Australia, mine came from Little Bird Electronics. So have fun! If you have any questions at all please leave a comment (below). We also have a Google Group dedicated to the projects and related items on the website – please sign up, it’s free and we can all learn something. High resolution photos are available from flickr. 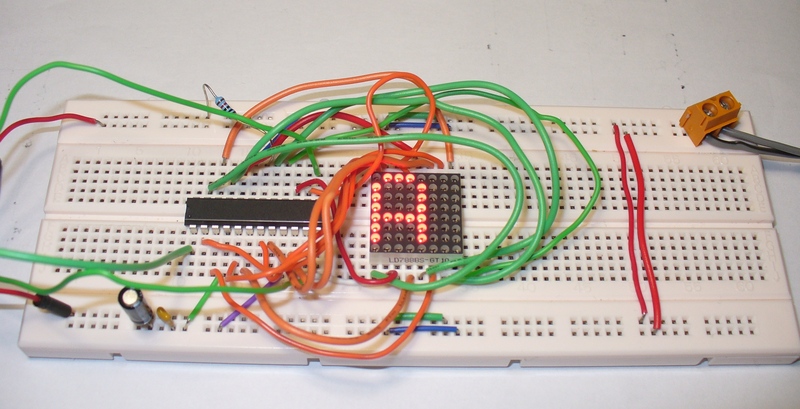 This entry was posted on venerdì, luglio 9th, 2010 at 10:04	and is filed under 7-segment, 7219, arduino, arduino display, circuit, example, LED, LED matrix, MAX7219, Maxim 7219, part review, review, tronixstuff, tutorial. You can follow any responses to this entry through the RSS 2.0 feed. Both comments and pings are currently closed.